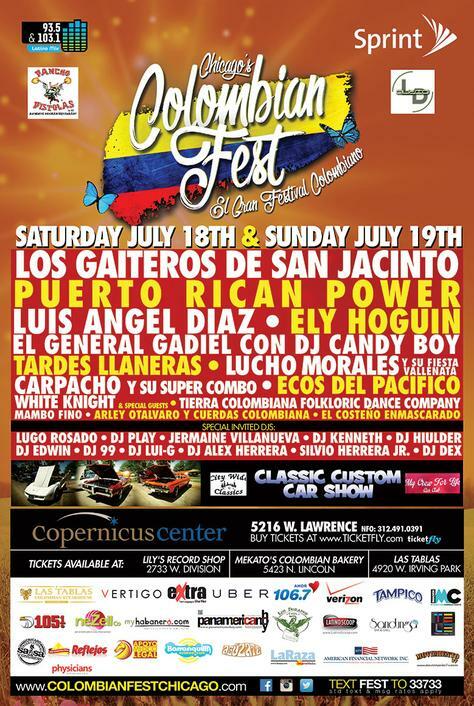 Colombian Fest – El Gran Festival Colombiano in Chicago. This two-day festival is the largest event in the area that celebrates Colombian history, culture, and independence. This event will be held from July 18 to 19 in the beautiful city of Chicago at the Copernicus Center at 5216 West Lawrence Avenue. It will showcase live music and entertainment, arts and crafts, gourmet Colombian cuisine, and other international fare. In addition, there will be beer and wine available for those of age. We will also be providing a Kid Zone with wall climbing, games, clowns, and other fun activities to keep young ones entertained while the adults attend the event with friends and family. Access to this area will be permitted with the purchase of a special wristband that is available on-site during the event. This two-day cultural music festival promises the largest in the mid-west, which will celebrate Colombia’s rich history, culture, and independence. LOS GAITEROS DE SAN JACINTO, THE GREATEST EXPONENTS OF CUMBIA AND COLOMBIAN CARIBBEAN FOLK MUSIC OF ALL THE TIMES / LOS MÁS GRANDES EXPONENTES DE LA CUMBIA Y LA MÚSICA CARIBEÑA FOLKLÓRICA COLOMBIANA DE TODOS LOS TIEMPOS. The best of the area’s culture, community, restaurants, artists, musicians, and businesses will be showcased to share in the honoring of Colombian independence. Currently, we are in negotiations with several international and local Colombian music groups. In the very near future, we will be announcing the final lineup for this historic event. Event Sponsor: Ld Audio Inc.